I recently received a review copy from IVP Academic of one of their November releases: Theology as Discipleship by Keith L. Johnson. The book is Johnson’s attempt at explaining how the discipline of theology should function as an integral part of discipleship, the Christian call to follow Jesus in worship and obedience. Theology of Discipleship deftly achieves this goal by clearly articulating the need for theology as a vital practice for faithful discipleship. At the same time, Johnson offers a solid and accessible work of theology himself as he explores concepts such as Christology, the Trinity, and participation in the Triune life while setting the foundation, context, and content of Christian theology. As he mentions at the beginning of the book, the book is largely the result of Johnson’s numerous experiences teaching introductory theology classes at Wheaton college. I currently teach similar courses at Houston Baptist University and can easily relate to and affirm the problems that Johnson acknowledges: students often are at a loss for why theology is relevant to their lives as Christians and are also fearful that it will distract them from actually following Christ. The book responds to these concerns in the format of seven chapters: 1) Recovering Theology, 2) Being in Christ, 3) Partnership with Christ, 4) The Word of God, 5) Hearing the Word of God, 6) The Mind of Christ, and 7) Theology in Christ. The heart of Johnson’s thesis is that theology is vital to discipleship because it trains us to rightly hear, understand, and use words about God which inevitably influence our religious practices. This emphasis, a key note that Johnson plays throughout the book, reminds me of John Howard Yoder’s statement that, “The task of theology is working with words in the light of faith.” He rightly notes that without theological training, Christians use an assumed “functional theology” that is often riddled with logical and biblical problems. The choice for Christians is not between theology or no theology, but between good theology or bad theology. After giving a well-reasoned historical explanation for the current divide between the academy (read: theology) and the church (read: discipleship), Johnson situates a proper Christian theology around the revelation of Christ: “The discipline of theology proceeds rightly when it begins from the presupposition that all right thinking and speaking about God, reality, and history takes its bearings from the life of the incarnate Jesus Christ.” I think Johnson could not be more right at this crucial point- all theology must be Christologically founded. Taking his cue from Barth, and others, he emphasizes this point repeatedly throughout the work. This leads him into a explanation of how Christians participate in and with Christ. He then addresses the place of Scripture and the church community (both dead and living) in the discipline of theology. He closes by discussing the scriptural calls to have to have the “mind of Christ” and argues that the art of theology is uniquely equipped to develop this mind inside of us and thus allow us to follow Christ faithfully. In this way, theology serves as discipleship. He closes the book with a gem: a list of nine ways that theology must be practiced in order to serve the church and act as a practice of discipleship. If I were the dean or chair of a confessional school, I would have this list framed in the office of every theologian I employed. While Johnson’s writing is accessible, I suspect that some readers not familiar with theology might find themselves struggling to keep up with some of his more nuanced theological arguments. Theologians might also be surprised (perhaps positively or negatively) with the amount of Scriptural engagement that guides the book. Those two comments aside, Theology as Discipleship is a refreshing and needed work as it convincingly sets forth theology as an act of discipleship because of its function to clarify speech and thought and to enable a more truthful and faithful understanding of Jesus (and thus, God). Thomas Jay Oord is a professor at Northwest Nazarene University who is perhaps best known for his theological approach to the topic of God’s love. He is also the author of the upcoming book, “The Uncontrolling Love of God: An Open and Relation Approach to Providence.” You can watch this video to see the basic thesis of Oord’s new work or read this blog post to see his theology “in action” after the Paris terrorist attacks. I had the privilege of asking Thomas a few questions about his upcoming book. I hope you enjoy the interview and I encourage you to order the book as soon as possible! Thomas – first let me say thanks for agreeing to let me ask you a few questions about your upcoming book “The Uncontrolling Love of God.” We are still a week away from the official release of your book and it is already #1 on the following Amazon lists: Systematic Theology, Science and Religion, and Christian Death and Grief. Did you expect such an amazing (and early) response to this work? Every author I know dreams about having his or her book being widely read and showing up on best-selling lists. So I am obviously pleased the book is being received so warmly. I didn’t expect a response this big! Perhaps one reason for its best-selling status is that it address big and complex questions using language understandable to the masses. I am a scholar who writes technical theological and philosophical material. But I worked very hard to write this book in an accessible way. Your book will likely create controversy, particularly among conservative Christians outside of the academy. What would you say to someone who might initially feel like passing up your work based on their assumptions about both their views and yours? I had dinner with Juergen Moltmann recently. During the conversation, he looked me in the eye and said, “Theology is supposed to be controversial!” I took him to be saying that the ideas about God — theology — should always stretch us, because a total grasp of God is always beyond our reach. I recognize that some people will feel uncomfortable when I address big and complex questions and then pose plausible but novel answers. I hope my proposals will be helpful to many people. And I never expect everyone to agree with me. I appreciate robust dialogue when done in love. I hope to offer winsome and persuasive reasons for the hope within me. When some readers find my proposals helpful, I’m deeply satisfied! Your conclusions in The Uncontrolling Love of God might be very different from what many readers learned growing up, believe, or are maybe currently teaching. Why do you think so much of Christianity has missed this key insight into the nature of God and his interaction with the world? Too many people start their theological reflection with the idea that God is a sovereign king or ruling Lord. This starting point is one some theologians consciously affirm but many others affirm it unconsciously. This goes for Christians and non Christians. For instance, we have Hollywood blockbusters titled “Bruce Almighty” and “Evan Almighty.” But I doubt film producers thought even once about a movie about God with the titles “Bruce All-Loving” or “Evan Omnibenevolent.” The default for many is absolute omnipotence. But I think Christians ought to be first to say, “When we do theology, we’ll start with God’s love and then work out the other attributes in light of love.” Maybe if we imagined God as the ideal parent instead of the controlling monarch we could do theology in ways I think are more faithful to the broad biblical witness. Your book brings together theology and science in a unique way. How does science influence your theological work? Do you think that there is a shortcoming in theology when it comes to letting the conclusions of science interact with theological issues? In my view, contemporary experience, in its various forms, inevitably influences our reflections about God and theology. To think about God well, therefore, we need to think about the world well. Science is one of the most powerful expressions of human existence. Theologians ignore science at their own peril. In my view, overall proposals for explaining existence must include what we think are the best in theology, science, philosophy, and more. The most convincing theology is multi-disciplinary. Your book also has a uniquely pastoral tone to is as you deal with the problem of evil and suffering in our world. Is this a purely academic exploration for you or are there personal experiences that drive your work as well? We all deal with evil. But some people deal with it more directly and deeply than others. My own life is not much different from most who experience pain. And my own questions about God’s activity in relation to evil are similar to the questions others have. So I’m not unusual in that way. I think Christians too often focus either on pastoral responses to evil or theoretical proposals to the problem evil. Most pastoral responses fail to address adequately the question, “Why didn’t God stop this evil in the first place?” Most theoretical proposals fail to take seriously the personal and therapeutic dimensions to suffering and tend to focus on some version of the best of all possible worlds defense. Few solutions to the problem of evil address both pastoral and theoretical aspects. I try to do both, although there is always more that could be said! I’ve personally been keen of your formulation of “essential kenosis” since I first read “Nature of Love.” I know that stands at the center of this book as well. If you had to pick one or two ideas other than essential kenosis that serves a foundation for your thesis, what would it/they be? You’re right that the notions of essential kenosis form the heart of the book. They do so, because questions of the nature of God’s love and power are central to essential kenosis. And getting clear about what we mean by God’s love and God’s power is crucial for so many aspects of theology. Another key idea in the book is that randomness, chance, or indeterminacy are real for us and for God. God cannot foreknow the entire future, either the free actions of complex creatures or the random events in the universe. Few theologians have admitted that randomness is real even for God and then worked this into their understanding of God’s providence. For someone like me who thinks love comes first in God’s nature, however, it is natural to think God cannot control creaturely freedom but also cannot control random events at the micro or macro levels of life. I know that the process of writing often is a time of clarifying ideas and connecting new thoughts. Did any of your conclusions in “The Uncontrolling Love of God” surprise you once you had finished the book? Two things come quickly to mind. 1) When doing additional research, I discovered that many theologians in the Christian tradition have said that God cannot act in certain ways. In other words, they thought God’s omnipotence is never absolute and always has limits. Jacob Arminius even goes so far as to list many thing God cannot do! 2) I gained far greater clarity than I had before on the relation of God to the so called “laws of nature.” I came to realize that it makes little sense to talk about “laws of nature” and more sense to talk about “law-like regularities” in the world. My novel proposal, consequently, is to argue that these law-like regularities derive from God’s steadfast love for all creation, including the smallest entities of existence and the most complex. Because God must love all others, God cannot interrupt the law-like regularities in the universe that originate from God’s steadfast love. Thomas, thanks once again for taking the time to answer my questions. Blessings on you and your work! I recently read a new book from IVP Academic entitled “Rediscovering Jesus: An Introduction to Biblical, Religious, and Cultural Perspectives on Christ” by David B. Capes, Rodney Reeves, & E. Randolph Richards. Let me begin this review by putting my cards on the table: I am a fan of David B. Capes. He was my professor at Houston Baptist University and was also part of my master’s thesis defense panel. Thus, my original interest in reading the book was due simply to his participation in the project (plus, it’s hard to pass on a book with positive reviews from Michael Gorman, Nijay Gupta, and Scot McKnight). However, as I read the book I quickly forgot about my personal connection to one of the authors and found myself deeply engaged in a beautifully written, biblically sound, and theologically informed book on the person of Jesus. I found this third task to be the most illuminating part of the book. While I am committed to understanding Jesus both canonically and theologically, I have always believed that there is so much more to learn about Jesus if we would just let certain texts stand by themselves first, before we try to make a composite image of the person and work of Jesus. The book is divided into two parts: Jesus in the Bible (Mark’s Jesus, Matthew’s Jesus, Luke’s Jesus, John’s Jesus, Paul’s Jesus, The Priestly Jesus, The Jesus of Exiles, and The Apocalyptic Jesus) and Jesus outside the Bible (The Gnostic Jesus, The Muslim Jesus, the Historical Jesus, the Mormon Jesus, The American Jesus. and the Cinematic Jesus). Each chapter ends with a bibliography for further reading and a handful of discussion questions. The bibliographies are typically top-notch, but I found some of the discussion questions to be lacking. Bottom line: there is a lot to like about this book. The treatment of the four Gospels is a fine example of excellent scholarship communicated at a popular level. However, as the authors got into the other New Testament literature, I sometimes felt as if they let a surface-level reading of the text overly emphasize differences between pictures of Jesus in the Gospels and other books. For Paul, I couldn’t avoid feeling that the authors sometimes let a simple reading of the text highlight differences that perhaps are not as significant as they first seem. (I would recommend Daniel Kirk’s “Jesus Have I Loved, But Paul?” as a resource that reconciles the apparent “differences” between the Pauline literature and the Gospels). I had the same feeling for their treatment of Jesus in Revelation, again thinking that they sometimes overplayed the difference between the Jesus of the Gospels and the Jesus of Revelation. To be fair, this is an explicit part of their project (highlighting certain differences), but I think the differences between the pictures of Jesus are still significant enough even with recognizing scholarship that undercuts some of the “apparent” different pictures of Jesus throughout the New Testament. Let me be clear, these criticisms are the result of an intentional attempt to find something lacking in this excellent work. The book is consistently engaging and always well-informed. I found the second part of the book just as fascinating and imagine that for many lay-people these would be the most impactful chapters. It is easy to disregard how much our view of Jesus has been influenced by American values and various forms of art. IVP Academic provided a copy of this book for review. Church and Conversation (Chs. 1-4) focuses on ecclesiology and ecumenity. Canon and Confession (Chs. 5-9) focuses on scripture, biblical authority and tradition. Christ and Creation (Chs. 10-12) focuses on Christology, creation and covenant. In Barth we see a truly unparalled focus on Jesus Christ, a truly christocentric theology at work, with a firm commitment to Holy Scripture as the unparalleled authority for the church’s faith and confession, and with an emphasis on proclamation and preaching as central to the church’s worship and practice, all within a theology dedicated to service to the church that focuses on themes of witness and discipleship (249). 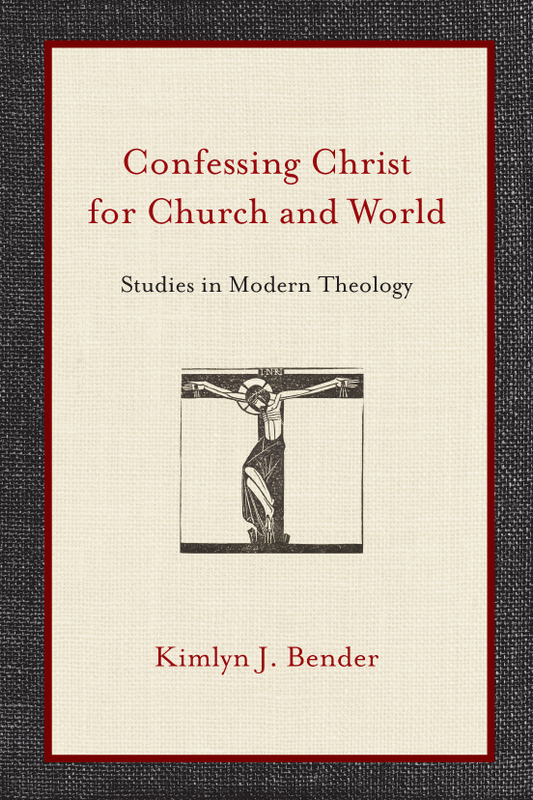 From this foundation, Bender builds a case for challenging Baptists tendency to make “statements of opposition and mutual exclusion, for example, pitting the Bible and tradition against one another” (250). Bender, first, explains that while Barth realizes that scripture and tradition have a relationship it is not on equal grounds. Scripture, as the unique revelation of God, is unquestionably superior to tradition. He writes, “All church proclamation, as well as church tradition, comprised of doctrine, creeds and confessions, must be based on Scripture which stands over them” (250). But, Barth does not go so far as to empty confessions, or tradition, of all meaning. Rather, Barth insists that for the church to confess its faith in the present it must pay attention to the church’s past confessions. Thus, tradition is important because in tradition the church reads scripture together. It is this idea, that the church, past and present, is needed for understanding scripture that Bender challenges Baptists tendency to have a “me and my Bible” approach to reading scripture. He even repeats a phrase I have heard often as a Baptist, “Ain’t nobody but Jesus going to tell me what to believe” (263). Bender argues that Barth challenges us at this point by reflecting on the importance of reading scripture together in the present by using the past. Bender writes, “Barth sees a real authority in confessions but does not see them as absolute, nor does he espouse forced subscription. He upholds the uniqueness of scripture against all creeds and confessions, but does recognize a real authority in them and refuses to ground Christian faith in subjective personal experience” (264). As a Baptist, I appreciate this challenge from Bender to take the past seriously. Baptists can sometimes fall into the trap of thinking Christianity began on the day they were saved. Faith begins when we “walk the aisle” and so why should we go back. But this idea is not only misguided it is dangerous as it leads us to prioritize our feelings and leads us to towards a “me and my Bible” approach to reading scripture. In Barth, Bender finds a voice that challenges this tendency by asking us to reconsider this approach and instead come to understand reading scripture as “we and our Bible.” While there is much we might want to argue with in Barth, surely this is a place we can find some humility and acknowledge he might just be right. Or as Bender writes, maybe we can ask and answer with Barth, “How does Jesus tell us what to do? Jesus’ voice is found in Scripture, and Scripture is read in a community of persons that, like us, he has called to be one people” (263-4).